There are more than 1,700 active Tallahassee subdivisions (also known as Tallahassee neighborhoods) and we like to keep an eye on which ones are seeing real estate activity. In fact, we publish a Tallahassee Subdivisions Report at least quarterly, but long-time readers know they can always go to our neighborhoods page to find consolidated articles and links to all homes for sale in Tallahassee neighborhoods. 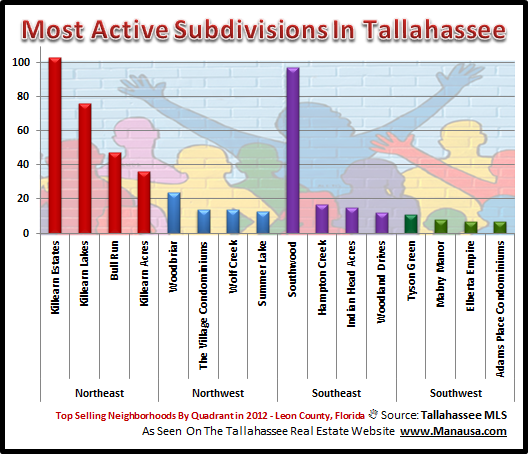 A quick peak at the real estate graph above reveals no surprises for the most active Tallahassee subdivisions in 2012, so our report will take a closer look at the neighborhoods with the most home sales in each area of the Tallahassee real estate market. Three out of four of the most active Northeast Tallahassee subdivisions are Killearn communities. In fact, they are three of the top five neighborhoods in all of Tallahassee, based upon the number of home sales thus far in 2012. Southwood in the Southeast and Woodbriar in the Northwest are the only other neighborhoods outside of NE Tallahassee that will record multiple sales each month. There are other active neighborhoods in Tallahassee that did not make the list, and we can expect a lot of home sales from them in 2013. I would expect Piney Z, Golden Eagle Plantation, Summerbrooke, Weems Plantation and Ox Bottom Manor to all post several home sales each month, putting their rate of sales ahead of all areas (excluding Southwood). Regardless of where you own a home in the Tallahassee real estate market, you should understand the pace of home sales in your neighborhood if you want to sell a home in 2013. If you are thinking about moving in 2013, just drop me a note and we can show you how to apply the information from our Tallahassee Subdivisions report to your advantage.